The Blondel diagram of a synchronous motor is an extension of a simple phasor diagram of a synchronous motor. The gross mechanical power developed per phase will be equal to the difference between Pin per phase and the per phase copper losses of the winding. Now consider the phasor diagram as shown in the Fig. 1. The equation (1) represents polar equation to a circle. To obtain this circle in a phasor diagram, draw a line OY at an angle θ with respect to OA. The circle represented by equation (1) has a centre at some point O' on the line OY. The circle drawn with centre as O' and radius as O'B represents circle of constant power. This is called Blondel diagram, shown in the Fig. 2. Thus if excitation is varied while the power is kept constant, then working point B while move along the circle of constant power. Now OB represents resultant ER which is Ia Zs. 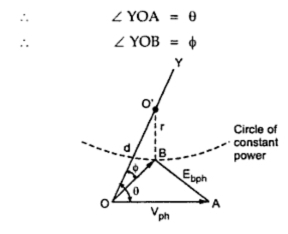 Thus OB is proportional to current and when referred to OY represents the current in both magnitude and phase. Thus the point O' is independent of power Pm and is a constant for a give motor operating at a fixed applied voltage V.
And the radius of the circle for maximum power is zero. Thus at the time of maximum power, the circles becomes a point O'. This shows that the circle of zero power passes through the points O and A. 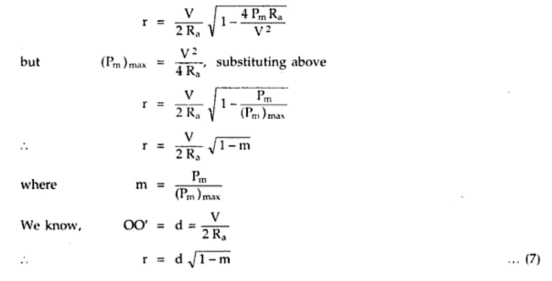 This is generalised expression for the radius for any power.